Both candidates claim to be in favor of cutting taxes, although Obama's people concede that his plan would raise taxes on a small minority of very high income tax payers. But a recent study from the Tax Foundation finds that both candidates' proposals would raise marginal rates for many middle income tax payers. Can both claims be true? If they can, which matters? The answer is that both can be true and both matter. What the candidates claim is that most individual taxpayers will pay less money under their plans. That may well be true, at least if we look only at income taxes and ignore indirect effects on taxpayers of other proposed changes in the tax code. If you want to know much poorer you will be with a given income as a result of having to pay taxes, that is the fact that matters. On the other hand, if you want to know how much poorer the country as a whole will be as a result of their plans, the marginal rate may be more important. It tells you how much you will be able to keep of each additional dollar you earn. That is one of the things that affects your decision, and other people's decision, of how hard to work at doing things that they can paid for, what quantity of goods and services to produce. It's also one of the things that affects the decision of how much effort to put into avoiding taxes, whether in legal or illegal ways. If the point is not obvious, consider a very simple and highly graduated tax system. The rate is 0% on the first $40,000, 100% on everything above that. Faced with that set of rates, most people now earning more than $40,000 would cut back by working fewer hours, taking longer vacations, accepting pleasanter jobs with lower wages, or in any of a variety of ways reducing their income to $40,000. The only reasons to earn more than that are that you like contributing money to the government or that you enjoy the work enough to do it even when you are no longer being paid for it. Everyone currently earning $40,000 or less and some people now earning more than that would pay less in taxes under that system than under a more conventional set of rates. But the country as a whole would be much worse off, because we would be producing and consuming a lot less. And, of course, the government would be collecting very little in taxes. The same holds for less extreme versions. High marginal rates give taxpayers an incentive to substitute leisure for income even when the value of what they could produce is more than the value to them of the leisure, since they are only getting part of that value. That is a part of what economists refer to as the dead weight loss due to taxation—a cost to the taxpayer that is not matched by revenue to the government. How does Obama manage to lower average rates while raising marginal rates—in some cases, according to the Tax Foundation, to over 50%? He does it by lowering taxes at the low end of the income scale—to well below zero. If, using invented numbers to explain the logic of the situation, a taxpayer with zero income receives $10,000 from the government and a taxpayer making $20,000 receives and owes nothing, then raising your income from zero to $20,000 makes you only $10,000 better off, corresponding to a marginal rate of 50%. And if you only start paying taxes at $20,000, then the rate above that has to be higher than if you started at (say) $10,000 in order to bring in the same amount of money from a taxpayer making $30,000. Some readers may find a graphical explanation of the point useful. 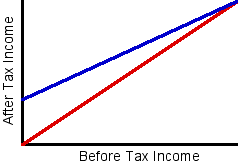 The figure shows two different tax systems, each in the form of a graph of after tax income as a function of before tax income. The red line is a flat rate tax; everyone pays the same fraction of his income. The blue line is a flat rate tax plus a demogrant, meaning that everyone starts at income zero with a fixed amount of money from the government and pays a fixed fraction of each additional dollar of income to the government. As you can see, everyone on the graph ends up with at least as much money after taxes under the blue system. The slope of the blue line is lower; for each additional dollar you earn your after tax income goes up by less than it does on the red line. That corresponds to a higher marginal rate. So your incentive to earn income is less under the blue system. Everyone is paying less under the blue system, so the government is collecting less money. But it is collecting it in a way that has a larger negative effect, a greater excess burden aka deadweight cost, on the total amount that taxpayers choose to earn. Hypothetically, if the higher marginal rates had other effects that helped the overall economy, say by lowering the budget deficit and debt, could people's incomes increase such that even though they are paying a higher marginal rate, they're making more money to pay that higher marginal rate on, thereby changing the amount of money they can actually keep to roughly the same or more than they were keeping at the lower marginal rate. I'm not sure I asked my question clearly, but I'd really like an answer if you can figure out what I mean. Some people say that with higher marginal rates, people will work harder. Since it becomes harder to buy something people aspire to, people will work more to make up for that lost income. While changes in marginal tax rates certainly can affect decisions, the magnitude of these effects can be of greater importance than mere fact that they exist. Can somebody point me to any studies of how much changes in marginal tax rates matter? I think Acton is confusing what economists call "income effects" with what they call "substitution effects." One can argue that if you are paying more taxes, you will work harder in order to make up for the lost income; this corresponds to the old idea of a backward bending supply curve for labor, meaning that rising wages result in people working fewer hours. But that depends on your average tax rate, not your marginal tax rate. If average rate goes down, as I think both candidates claim it will for most taxpayers under their plans, then the taxpayer has more money, so the income effect would result in working less. If marginal rates go up, as they apparently do for many taxpayers, the tax payer gets less income for each additional hour of work than he used to, so the substitution effect also results in working less. I think talk about tax regimes, including marginal and average tax rates, often disguises the main problem. When it comes to taxes, it's the spending! Any dollar spent by government requires the present value of a dollar tax on people. Thus the only way to reduce taxes is to reduce spending. There are two other important tax effects. When capital gains taxes are much lower than income taxes, a professional can earn more by working less at his day job and converting applying his labor to improvement of his property, which he can convert on sale at the lower capital-gains tax rate or, if it's his principal residence held for two years, at a tax rate of zero. Instead of hiring a plumber in a 50% tax bracket, a high-earning professional in a 50% bracket can stay home and do $1000 worth of plumbing himself for $250-worth of his labor. This is a classic case of the real-world ignoring the microeconomic model Friedman is peddling. which points out that after the large tax cuts of 1986, the labor supply of the rich remained unchanged. Friedman's model would have them increase the supply. And once again, David commits the fallacy of counting only the costs of a tax, but not counting the benefits of the government services purchased with the tax. It's these continual, slanted biases towards models which are contradicted by the real world and one-sided accounting that make me consider David a propagandist. These biases riddle David's books as well, such as "Hiden Order". Huben, a government service only has value to me if I want it. You are making the classic mistake of applying a theoretical absolute sense of value to real relative people. If you value these services so much, go buy them yourself, but leave me out of your fantasies of the value of government services like the Iraq war, or the Great Mortgage Meddling. Russ, if you think you're getting a bad deal, you're welcome to vote with your feet and emmigrate. Thousands do it every year. The big problem with your analysis is that it presumes that either utility is proportional to inccome or that people are rational. It's clear that at least one of those is false. I wonder if a way of maintaining the current tax take and reducing the marginal tax rate would be to estimate each person's income (ideally based on factors that they cannot control). You could have a 50% tax on income while only having a 20% marginal tax. This has the effect that everyone on minimum wage pays 0 tax. Depending on how accurate the estimates are, most people should earn more than E*F, so most people will have a marginal tax rate that is low, even if they have to pay the same as now on average. If you are earning less than your estimate fraction, then you would have quite a large marginal tax rate. Ideally, the estimate should be based on things people can't control. However, that could look like discrimination. Age would be perfect as most people earn more as the get older. Things like qualifications would also be a strong indicator. However, it would discourage people from getting formal qualifications. In fact you might have on your CV that you attended college and just barely failed the fourth year. Ofc, people who already have qualifications wouldn't be able to do that though. Industry would be another indicator. This would have an effect on inter-industry changes of profession. However, to benefit, you would need to change from an industry from a high average income to a lower average income. Also, everyone would effectively receive from the IRS an estimate of what they should be earning, this could make yearly performance reviews more interesting. "The only reasons to earn more than that are that you like contributing money to the government or that you enjoy the work enough to do it even when you are no longer being paid for it." In such a world, why would anyone earn more than that? I can't see a business offering a salary greater than $40,000 if everything beyond that went to the government. It'd be a lot cheaper just to offer $40,000 as the maximum salary and give the government nothing. everyone on the graph ends up with at least as much money after taxes under the blue system.... Everyone is paying less under the blue system, so the government is collecting less money. I can't believe nobody else has pointed this out: the above statements are true only because David has arbitrarily cut off the graph at the point where the red and blue lines meet. To the right of that point, wage-earners would get less money under the blue system and the government would get more. If there were enough people far to the right of that point, the government could end up with more money than under the red system. At least, that's what Obama is banking on. David's main point (that the lower marginal rates of the red system encourage people to work harder, thus producing more goods and services) remains, but I'm not convinced that the difference between a 30% and a 40% marginal tax rate actually affects people's work behavior much. I for one think about marginal tax rates only when planning tax-deductible things like charity donations. Is there factual evidence on this? What if Neither Candidate is Eligible?